I recently had to retrieve some information from a WSUS server and was unable to connect to it from my management station. A little research identified that it was using the Windows Internal Database, which doesnt allow remote connections. Below is from http://www.mssqltips.com/tip.asp?tip=1577 that describes how to overcome this shortcoming. Microsoft products such as Windows Server Update Services (WSUS) 3.0 and Windows Sharepoint Services (WSS) 3.0 ship with SQL Server 2005 Embedded Edition. Now called the Windows Internal Database, more and more system administrators charged with managing WSUS and WSS are faced with the challenge of managing these databases. Since most of these system administrators are not full-fledged DBAs, how do they manage the Windows Internal Database? 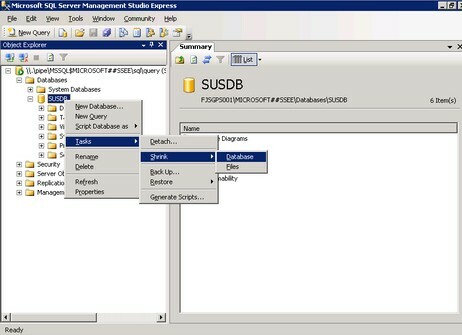 Once you've managed to register this instance in SQL Server Management Studio Express, you can now administer the WSUS 3.0 and WSS 3.0 databases like shrinking the database files or moving them to a different disk partition dedicated for them to avoid insufficient disk space issues. 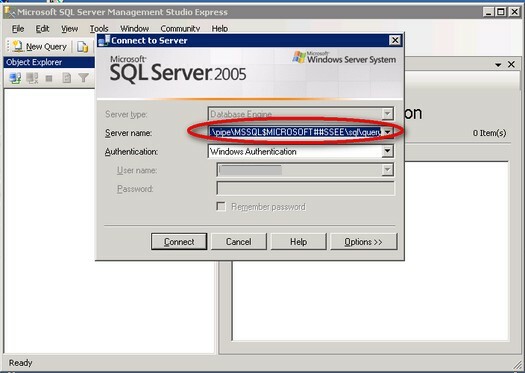 You can then run your administrative T-SQL scripts once connected to this database instance. While these are possible reasons to administer the Windows Internal Database, it is not recommended to do anything beyond performing backups, moving or shrinking the database files. Modifying database schema or database properties would break supportability of these products. Plus, any changes made to these databases can be overwritten by the products' service packs or cumulative updates.